The company 1-800 FLOWERS still uses home-based call center agents. However, it now hires them through Sutherland CloudSource, rather doing so directly. Being in the call center industry, the company has agents who perform a variety of customer service and sales tasks. For example, they take inbound calls and complete multiple transactions using several software applications. Agents that are bilingual in Spanish are in high demand and may even be paid more. Headquartered in Long Island, NY, this online florist company hires call center agents in its work at home jobs. More specifically, they hire temporary agents during its peak seasons and holiday periods and tend to keep on some high-performing home-based agents for permanent jobs. 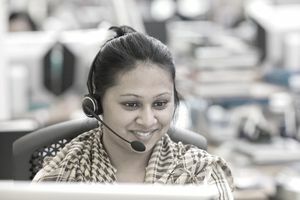 The company has a brick-and-mortar call center in its Long Island headquarters, where its customer contact call center handles calls for additional brands such as Cheryl & Company Gourmet Cookies, The Popcorn Factory, and Fannie May Chocolates. At 1-800-Flowers, agents are considered employees, not independent contractors. However, most agents are hired on a seasonal and temporary basis for popular holidays and celebrations like Mother's Day, Valentine's Day, Christmas, and so on. Typically, peak season agents are needed for full-time work due to the high demand for flower delivery. If you want to become a florist or create beautiful flower arrangements, working for a company like 1-800-Flowers could be beneficial to your career. Even if you don't get hands-on experience working with flowers, the customer service with the clientele will add to your skill set. This type of entry-level job pays around nine dollars an hour. Agents are paid an hourly rate for both times on and off the phone, and training is paid. While the company offers benefits to full-time employees, most of the jobs offered are seasonal and temporary gigs. The official jobs page keeps its job description for work-at-home agents up all year, but it typically hires seasonally. If it's not hiring, you can still submit your email to be contacted when hiring opens back up. Most often, the company will begin the hiring process months before major holidays. To start the application process, create a login and provide basic information. At this point, you want to ensure that you live in one of the states where the company hires. After you've entered initial information, candidates are asked to perform an assessment that asks a series of 50 personality-related and personal history questions. Then, an assessment will ask 100 questions about how you feel about various workplace issues. If you pass that assessment, you will then be asked to view a 15-minute simulation of the online training. After the final simulation, you'll be asked to perform a sample call for an evaluation. Disclaimer: Advertisements for work at home jobs or business opportunities placed on this page in the section labeled "Sponsored Links" or elsewhere are not necessarily legitimate. These ads are not screened by the author but appear on the page due to having similar keywords to the text on the page.